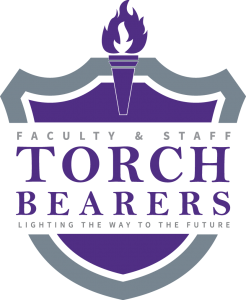 The University of Central Arkansas Faculty and Staff Campaign provides an opportunity for employees to show their support for the university through annual giving. Your gift can be made through a variety of channels, including payroll deduction, and designated to a fund of your choice. Most importantly, your gift will help engage, challenge, and prepare our students for their future. When we invest in our university and students, others follow suit. Regardless of size, any contribution can have a huge impact on a student’s life. Gifts can support scholarships, department needs, emergency grants, student travel, student organizations and many other areas of need. Show your pride! Give a gift and count yourself among those who don’t just say they believe in UCA and its mission – they show it. One-time gifts can be made by cash, check, credit card, online. 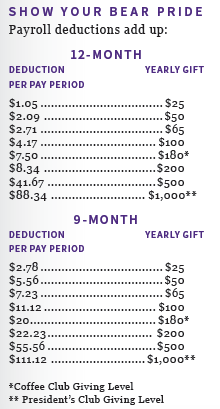 You can also opt-in to payroll deduction online or through this PDF form. Find the list of more than 600 funds you can give to here!